Felt bad about the anole making a meal out of one of my favorite critters. *sigh* hey, but what can you do?! Its nature and sometimes its not always sunshine and roses. 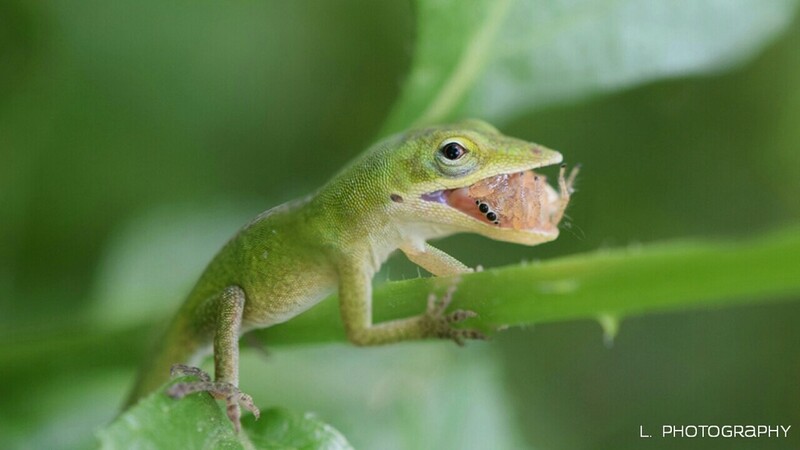 Atleast the anole found what I assume to be a tasty meal. This is the second picture I've gotten recently with something being eaten. As a photographer I'm thrilled to capture such a image even tho it is a sad one. Wonderful capture! The composition and the soft background are excellent! Well done! incredible capture - isn't that amazing how far he can open his jaw? fav. Oh my word, what a great shot. Super timing! Sooner or later if you take nature photographs you start to see a lot of the food chain in action. It's not the beautiful, peaceful place we like to imagine....it's a struggle for survival for most animals, and most animals are some other animal's food. I often wonder how we humans got to be head of that food chain and generally don't have to worry about being hunted. Except by other humans, and for stupid reasons. Excellent shot. Yum. . . . Fantastic shot! Fav. Superbly done and your DoF control is perfect and makes the image - Fav! Nature is amazing. Great capture! OH MY - great nature picture, sad as it may be. fav. This is amazing! Fav instantly. Such a phenomenal shot. Fav! Fantastic shot and well done getting on the TT with it. Super clarity on the lunch time meal - love how his stance is.